Paul Merson has suggested that Marko Arnautovic’s attitude at West Ham has improved recently. The Austrian put in a much brighter performance against Chelsea than he has done for some time on Monday night, and Merson believes that it stems from a different personal outlook. Speaking on Soccer Saturday (Sky Sports News, April 13th, 13.20pm), he said: “I don’t know if somebody has had a word with him. There was a ball played to him the first half and it went right over his head, nowhere near him. Usually he throws his hands up, but he sort of gave the thumbs up to say unlucky or whatever. “I thought ‘something’s happened here’. He worked hard. 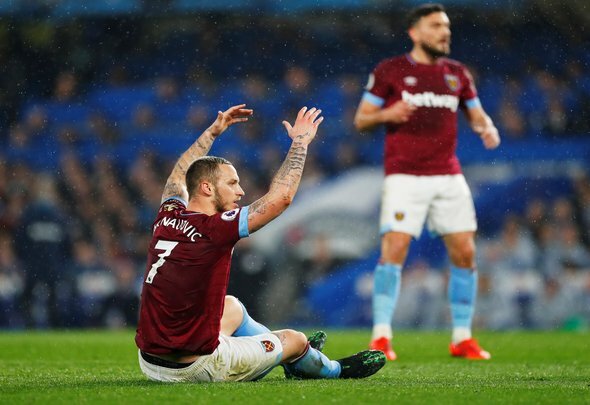 Arnautovic is probably one of the most frustrating players that West Ham have every had. This is clearly a player who can turn it on, who can dominate a match when he sees fit, but far too often he has looked disinterested this season. The obvious turning point was his botched move to China, but having signed a new contract in the immediate aftermath of that, you would assume that he might try a little harder at least to get himself back into the form that saw him attracting interest in the first place. Monday night was the first time he actually looked up for it since January, and that’s just not good enough. Whether he has had an epiphany, or whether he has one eye on the calendar with the transfer window slowly rolling onto the horizon once again is anybody’s guess, but really, he needs to put in this kind of performance on a much more regular basis.